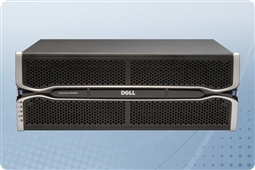 The Dell PowerVault MD3260i storage array brings high performance and high density in an efficient, 60-bay 4U form factor. This robust and scalable system is ideal for consolidating environments that require simplified high performance, high availability and reliability that your SMB can count on. Offering 1Gb iSCSI connectivity and up to 8Gb controller cache, the Dell MD3260i is ideal for demanding workloads like VMware or Hyper-V virtualization. The MD3260i iSCSI array can support to up to 32 host servers. With the addition of the Dell PowerVault MD3060e dense expansion enclosure, the PowerVault MD3260i storage system can support up to 180 3.5” or 2.5” hard drive disks. Click customize below to build your own custom storage array, or add to cart to buy your Dell PowerVault MD3260i 1Gb iSCSI storage array today! Curious if the Dell PowerVault MD3260i SAN (Storage Area Network) iSCSI array is right for your business continuity and budget? Check out our Survival Guide: Avoiding A Data Apocalypse today! 10TB (20 x 500GB) 7.2K 6Gb/s NL SAS 2.5"
20TB (20 x 1TB) 7.2K 6Gb/s NL SAS 2.5"
40TB (20 x 2TB) 7.2K 12Gb/s NL SAS 2.5"
2.9TB (20 x 146Gb) 15K 6Gb/s SAS 2.5"
6TB (20 x 300GB) 10K 6Gb/s SAS 2.5"
12TB (20 x 600GB) 10K 6Gb/s SAS 2.5"
20TB (20 x 1TB) 7.2K 6Gb/s NL SAS 3.5"
40TB (20 x 2TB) 7.2K 6Gb/s NL SAS 3.5"
60TB (20 x 3TB) 7.2K 6Gb/s NL SAS 3.5"